Every month we’ll profile one player and the spectacular things he’s doing. Come back to see if your favorite player has been selected! Those unaware of the skills and finesse may call him Josh Smith, but everyone knows that "Smoove" is a more fitting name for the power forward coming out of College Park, Georgia. Smoove is a homegrown "Jawja" boy who has never faltered in his support of the state, and this can be seen by the tattoos that cover his arm displaying the popular Atlanta skyline with a highway sign thrown on for good measure. But enough about what makes Smoove the poster child for everything Atlanta and Hawks, this young man has shown season after season that he puts his entire being into playing the sport of basketball. How about some facts about Smoove? 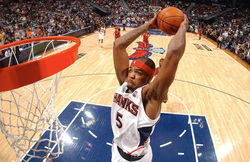 Smoove is most known for when he won the NBA Slam Dunk Contest during his rookie year at the 2005 NBA All-Star Weekend. That 2004-05 season, he averaged 9.7 points, 6.2 rebounds and 1.95 blocks per game and was selected to the NBA All-Rookie Second Team. Smoove averaged 2.25 blocks per game during the 2005–06 season to give him a rank of seventh in the NBA. On March 3, 2007, Smoove broke the 500-block mark and became the youngest player in NBA history to accomplish this feat. In the 2006-07 season, Smoove completed the season with 16.4 points per game, 8.6 rebounds per game, 3.3 assists, 1.4 steals and 2.9 blocks, a notable improvement from two seasons prior to that. In the 2008-09 season, Smoove ranked 13th in the NBA in bpg. On October 30, 2009, in a home game vs. the Washington Wizards, he became the youngest player (at 23 years old) to reach 900 blocks. Then, on February 2, 2010, against the Oklahoma City Thunder, Smoove became the youngest player (at 24 years old) to block 1000 shots. Last season, Smoove averaged 16.5 ppg, 8.5 rpg, 3.3 apg, 1.6 bpg and 1.3 spg in 34.3 mpg. He also had 26 20-point games, led the Hawks in bpg, spg, and FTM while also being the team-leader in rebounding 34 times. So far this season, Smoove has been making a strong case for why he should be a part of the All-Star Game, averaging 15.1 ppg, 8.8 rpg, 3.2 apg, 2 bpg, and 1.3 spg. But enough with the statistics that can be found on NBA.com and Smoove's own http://www.jsmoove.net website, have any of you SEEN how he's been playing in these past contests?! He has had five games where he scored 20+ points and had a 30-point game against the Charlotte Bobcats. Smoove was often accused of being hot tempered, both towards officials and coaching staff. Many characterized him as "childish" and closely watched how he reacted to what he perceived as bad calls or plays. Forget those days! Smoove has made a conscious decision to improve not only his playing but also his attitude. Smoove is learning which battles to choose to fight and it shows. He still becomes frustrated if he goes up for a layup, gets fouled, and misses the shot, but the fans love this kind of intensity. It drives him on both sides of the court. Smoove has been working on developing a better jumpshot to broaden his game, why should we blame him? When he plays as hard as he has been playing, it only makes sense to try to become a better all-around player. Smoove started this season 30 pounds lighter, with one thing on his mind, winning. Atlanta fans must recognize and appreciate the gem that we have in J-Smoove, the Atlanta native who puts on for his city every game. Keep an eye out for this guy! If his numbers from the Development League (D-League to those of us in the "know") are any indication, the Hawks have picked up a special piece in Ivan. Having played for the Reno Bighorns, Austin Toros, Erie BayHawks and overseas with the Jeonju KCC Egis all since 2007, Ivan Johnson, now age 27, averaged 18.4 points and 7.3 rebounds on 51.7% shooting. He played in a total of 94 contests, starting more than half of them. Most notable of his statistics is that, of those 7.3 RPG, 5.3 of them were defensive. In his '10-'11 playoffs appearance with the Erie BayHawks, Ivan averaged 23 PPG, 9 RPG, and 3 APG in 36.7 MPG in the three games he played. If he's not your favorite now, he just may be after seeing some PT. After an impressive display in the pre-season games, Ivan remained on the Hawks' roster after waivers were requested of many other players. Although he has not seen much game time in the first two games of the season, he is definitely someone to not forget. Ivan plays with an aggressiveness and intensity that Hawks players and fans alike love to see. During the pre-season game against the Bobcats, Ivan's plays would be answered by the ever-so-familiar "towel wave" done by J-Smoove. Seeing how the players received him and how well he played offensively and defensively, it was no surprise that the Hawks would decide to keep Ivan. Although there have been many reports on Ivan's temper, I see his passion for the game as what is needed for the team. Ivan likes to let it be known to the other team that he will not be passive and will not back down and that type of attitude is useful in a game. As long as he does not let it take control of his emotions and negatively effect his game, it is a definite plus. Ivan's D-League play was so impressive last season that 16 league coaches voted him to the Gatorade All-NBA Development League First Team. He will bring a special something to the team for sure!